The designs are stunning. For the Bartok, Michael Levine uses a giant gold frame as the front of a sort of “perspective box”; the stage is quite steeply raked and the side walls converge with projections of seven locks on them. Within this space a brilliant lighting plot and projections (Robert Thomson) create an almost holographic feel. In fact it reminded me very much of watching Wim Wenders’ series of 3-D films of iconic buildings. 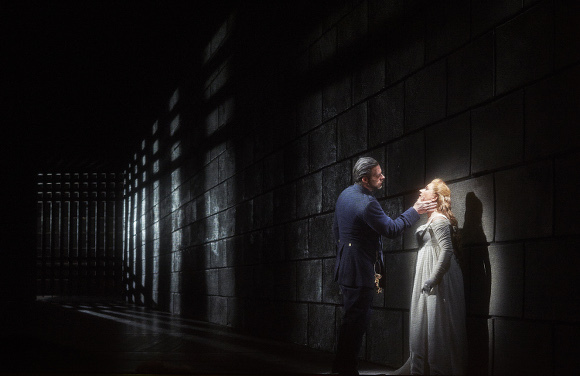 One could write pages about the various ways the set and lighting combine to convey the essence of the largely unseen contents of the seven locked rooms. The Bartok is sung by John Relyea and Ekaterina Gubanova. Relyea’s powerful, sepulchral more-bass-than-baritone sound seems perfect for the sinister Duke. Gubanova is the perfect foil as his over curious bride. 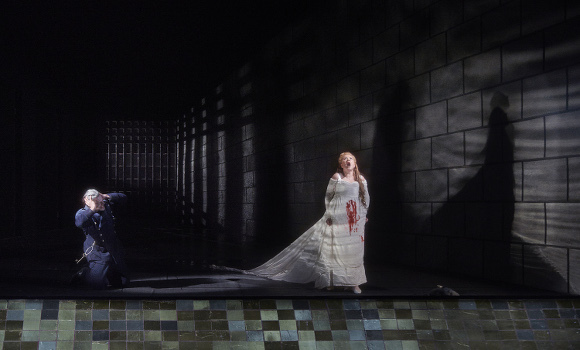 They are supported by three male actors who appear at the end as Bluebeard’s former (dead?) wives in a quite stunning tableau vivant. There’s a huge orchestra with extra brass in the wings of Ring 5. It’s a score I think I need to hear again to really “get”. It’s incredibly loud in places and must pose some real issues of balance for the conductor. Johannes Debus, I thought, did a fine job of marshalling this huge sound while not covering the singers. For the Schoenberg, the set is somewhat more subdued (it’s the same set, it’s the lighting having that effect), indeed almost monochromatic. Lepage has set the Woman wandering in the woods looking for her lover as a flashback retold in a mental hospital. The three actors play an observing psychiatrist, her lover and his mistress. They are actually pretty remarkable in the sheer physical work they get through. 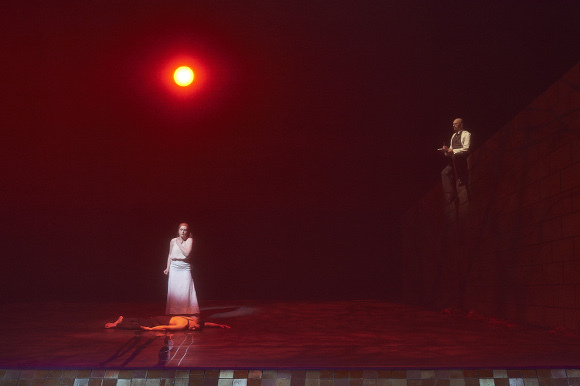 There’s a really clever use of a trapdoor at the front of the stage which combines with the lighting to create a sort of pool of blodd into which the lover disappears; just one of many pieces of very clever stagecraft. The Woman is sung by Krisztina Szabó (ironic that the Hungarian-Canadian gets the German to sing?). 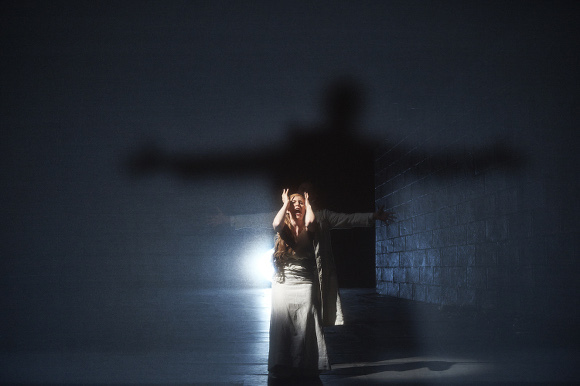 She combines a terrifyingly intense acting performance with actually being able to sing Schoenberg’s crazy music. This piece is wild and unstructured even by Schoenbergian standards, falling as it does in the period between him abandoning tonality but before he’d worked out his twelve tone method. Kudos again here to Debus for getting the orchestra to play with great clarity. And, again, I need to listen to this again. It’s a short but intense evening. The show runs just under two hours including an interval. And it’s powerful, if not entirely comfortable, music theater. This twenty odd year old production feels very fresh and modern. This double bill plays at The Four Seasons Centre and there are six more performances between now and May 23rd. This entry was posted in Performance review - COC and tagged bartok, coc, debus, gubanova, lepage, levine, relyea, schoenberg, szabo, thomson by operaramblings. Bookmark the permalink.